Eric Robson and his panel answer the horticultural questions from Kent. With Anne Swithinbank, Pippa Greenwood and Bob Flowerdew. Q – Is it necessary to put crocks at the bottom of pots? 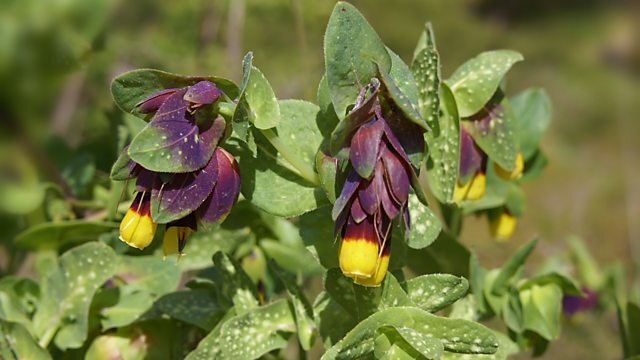 Q – Would you consider that Cerinthe is a weed? Bob – There’s no such thing as a weed. They are just plants you haven’t found a use for yet. Eric – What about Japanese Knotweed? Bob – Japanese Knotweed actually attracts one of the Hawk Moths, the shoots are apparently edible, and it’s very decorative. Q – I want to start growing vegetables with my five-year old son. What can you recommend? Bob – Almost anything. Quick-growers in pots are great. A broad bean seed for example. My kids really enjoy fruit because it’s nicer to eat! Strawberries and blueberries grown in containers are ideal. Q – Our garden is a thin skin of turf on rubble, how can we make it into a wildlife-friendly area? Bob – Put in more native plants. They attract caterpillars. Our natives are quite wild so will suit this ground. Q – How long do I need to wait before growing vegetables after chickens have been on the land? Bob – As soon as you turn the soil it will be wonderful. Maybe a little bit acidic so you might need to lime it. Start off with brassicas. For salad crops I’d put them through horticultural paper or paper tablecloths to keep the soil from splashing onto them. Q – Which gardening practice or tradition should we consider stopping in order to encourage more wildlife? Bob – Burning prunings. Make bundles of them instead for wildlife to live in. Anne – Over-zealous pest control. Eric – Don’t be too tidy! Q – I have a beautiful 80-foot, south-facing redbrick wall with an established Wisteria at one end. What climber with scent and colour can you recommend for the wall? Pippa – Cytisus battanderii (the Pineapple Broom). Anne – Roses. Peachy/apricot ones like ‘Lady Hilligdon’. Through that put through the Chilean potato vine (Solanum crispum) or the Solanum laxum. Bob – ‘Doyenne du Commise’ Pear. Train it as an espalier. Get a ‘Beurre Hardy’ to pollinate. Then put a grapevine in too – I’d recommend ‘Siegerrebe’, and ‘Boskoop Glory’, ‘Flame’. Also, squeeze in a Passiflora caerulea. Q –I have a Mimosa tree (4ft tall/1.2m) where should I plant it and how should I care for it? Anne – This is Acacia dealbata. It will survive winters down to about -10C. They need good drainage and some shelter. Make sure you plant into a moist pot.